To the west of Quinten, the mighty Seerenbach Waterfalls gush from a cave system and tumble in three cascades almost 600 meters down the cliffs. The waterfalls are especially impressive in spring, when the melting snow turns them into a torrent. Located high up on a sunny plateau and overlooking the northern shores of Lake Walen is the town of Amden. The village, its adjoining ski slopes as well as the hiking trails are often above the clouds and thus, it’s a popular holiday destination throughout the year. On the other side of the lake, another highlight awaits at Flumserberg, the biggest winter sports area in the region consisting of several villages and a huge network of slopes, trails and cycling paths. 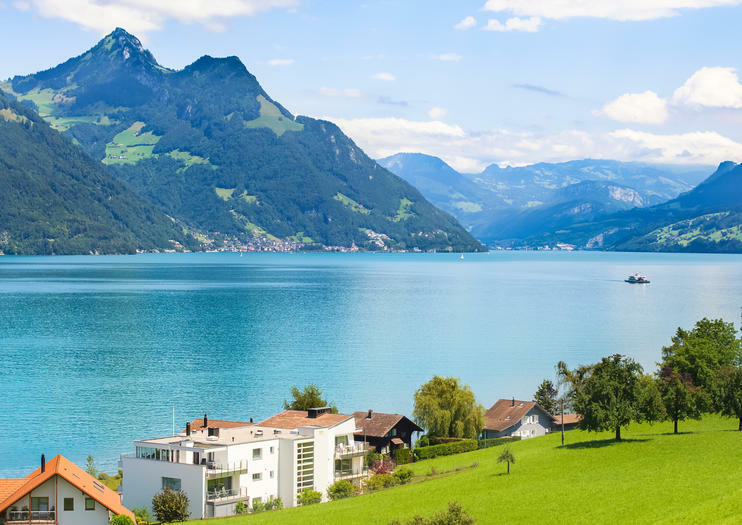 Lake Walen is located in eastern Switzerland, roughly an hour away from Zürich. There are direct trains from Zürich to Walenstadt, but to get to Weesen, a change from train to bus is necessary in Ziegelbrücke. The boats on Lake Walen run throughout the year, although in winter the service is limited to the route from Murg to Quinten.